The Dilapidated Marco Luethy Weblog - Weblog > Bern! Published Wednesday August 2nd, 2006 via a mobile phone but was later modified with a computer. Today we spend our day in the capitol Bern where i was bourne. I love it here. Its one of the most beautiful old european cities i know. 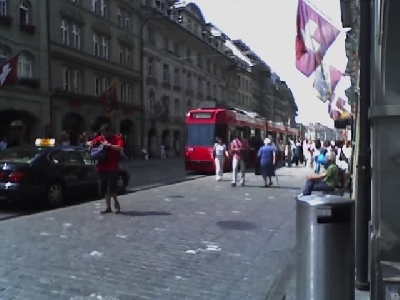 Because it wasnt bombed in ww2 it still has this old and historic medieval feel to it with a strong hit of modern with futuristic trams that roll by almost silently because theyre powered by overhead electric cables. People on the streets from every corner of the world.